This month I’ll let some images tell the story. The month’s activities were concerned mainly with two textile events: Fibres at Ballarat and Textile Fibre Forum at Orange. Both are for 5 days. Both are intensive. Both are wonderful. 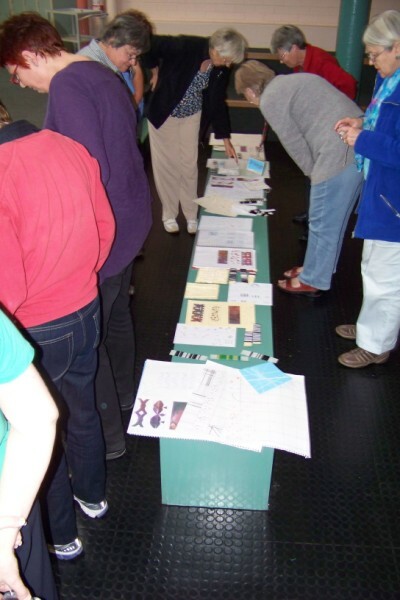 At both I taught a class called “Images in Cloth”. And more importantly, at both I had a wonderful group of women who did amazing work in my class. I was thrilled with what they achieved. 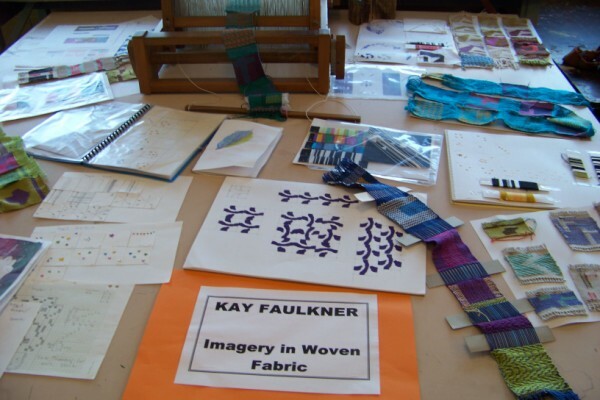 In “Images in Cloth” we spent half a day exploring various approaches to design and then in the remaining time wove images using various structure in pick up on a “universal” threading. To give an overview, I have included an image from the start with the class in Ballarat and one from the end with the class in Orange. I was very fortunate that June acted as tourist guide in Ballarat and showed me the sites. One of our first stops was seeing the statues in the Botanical gardens. 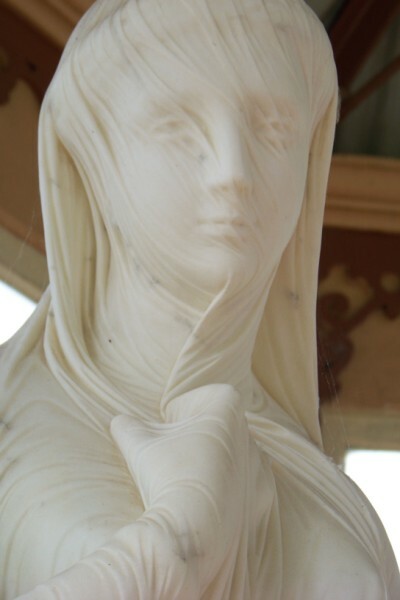 It seems appropriate to include this image because of the implied drapery of the veil in this statue. It looks like cloth and appears so real. I have only shown the head as the image does show the drapery so clearly. We then went to see the mill at Creswick. I was in for a treat! As I walked in the door I noticed that there was a series of wall hangings in the style of Peter Collingwood’s macro gauzes. They were by Ian McKinnon. It was a treat to see hand weaving in an industry setting. The two sat very nicely together. 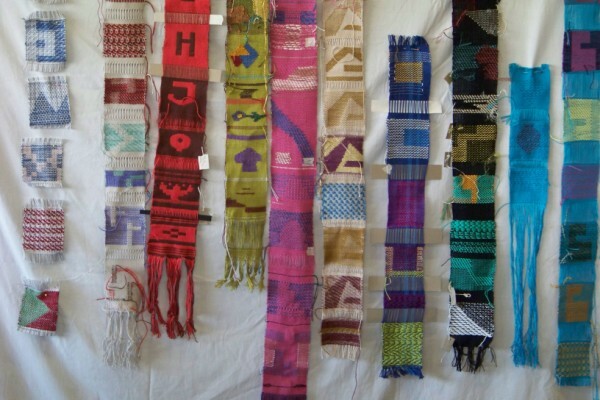 I did meet with Ian, the artist who is also in charge of the looms and had a very interesting discussion on his weavings. I was very impressed by his work and did acquire one. In addition, I was very fortunate as I had a tour of the mill. It was fascinating. 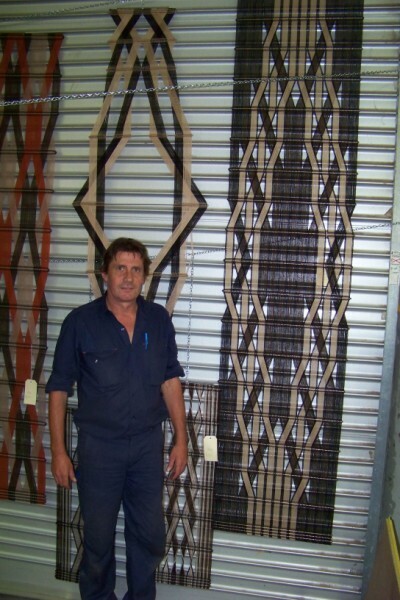 Ian McKinnon in front of some of his macro gauzes. Ian and June, my tour guide, beside one of the looms at Creswick. A variety of woolen fabrics were being woven. The Mill has a shop where many beautiful items are for sale. 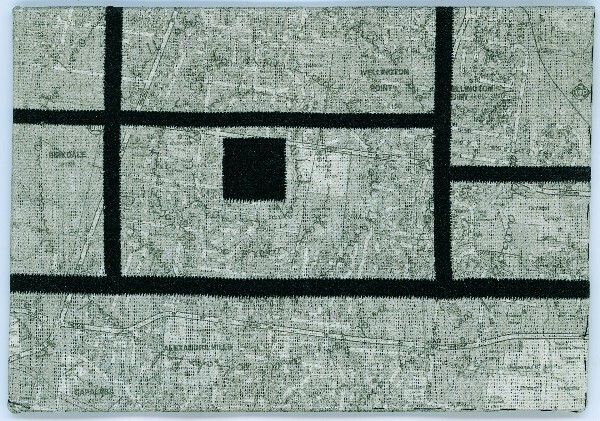 In 2008, Redland Regional Art Gallery had acquired a piece of my work titled Which Way. At the time I was running short on time and didn’t organise photography. Then when it was acquired, it was too late. But the Redland Art Gallery has kindly organised me a copy of the image as it appears in their catalogue (It appears in the “Photography and New Media” section). I am delighted to finally have an image. 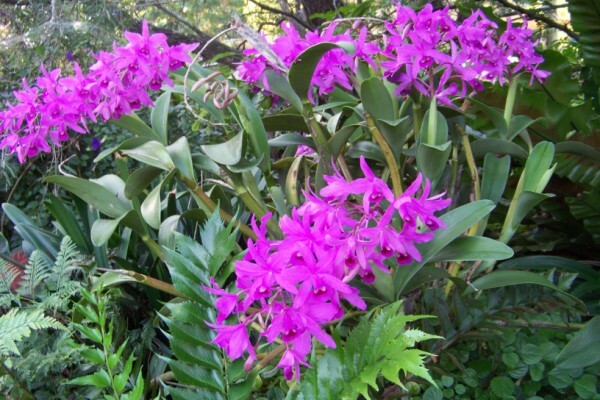 I know Autumn is coming and Summer is nearly done when these orchids start blooming. It is quite a display this year. 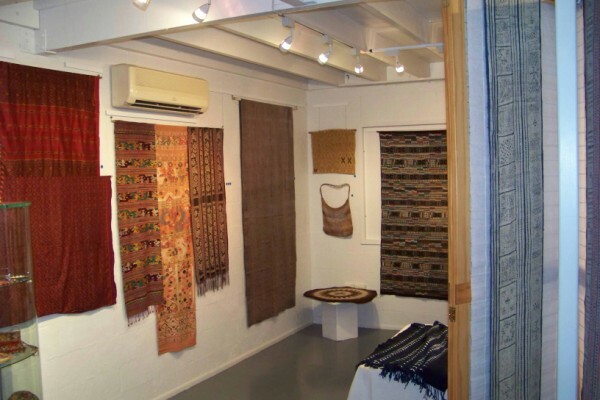 A most amazing exhibition from Marjorie Morris’s collection of textiles was exhibited at Gallery 159. The 140 items had been collected over a lifetime. She also had stories to tell of her adventures in collecting them. She was a very intrepid traveller indeed. It was a very diverse collection and many items were for sale. More details can be found in Textile Fibre Forum magazine, Feb issue #97. One of this month’s activities was a more comprehensive investigation into discharge. As artists/craftspeople we often become set in our comfort zone and use one technique, ignoring other possibilities. 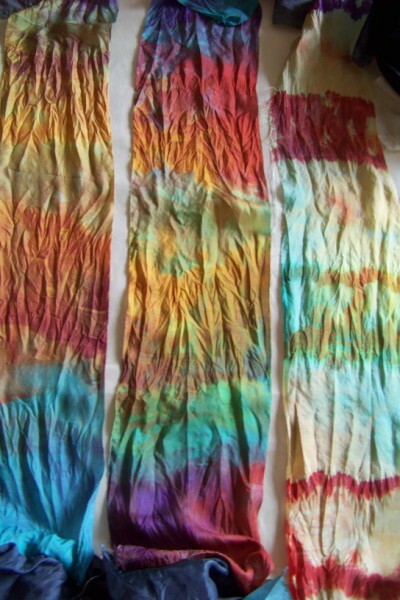 I have been doing discharge for many years, predominantly with bleach and the occasional TUD, but now, I took the opportunity to carry out some tests using 3 discharge chemicals on various dyed silk. In preparation I dyed silk fabric black with procion, and acid dyes (all the dye systems I had on hand). I then divided the fabrics into 3, knotted them (as I wanted some “resisted” areas) and used TUD, Formasol and sodium hydrosulphite on each. Each of these 3 chemicals have specific dyes they react with and fabrics they can be used on. All can be used on silk. In addition to the black, I random dyed a piece of silk with batch method using several colours for sampling. Sodium Hydrosulphite was rapid. Next time I will supervise the process more closely as I may have missed some interesting colour change. I did not keep the fabric in the bath as long as the recipe stated. Formasol stank!!! much more than the other two. The results marked with a * have interesting colour changes. The results marked # are worth using if black /grey or black/neutrals are required. It would be a very interesting exercise to mix your own black to see if you could vary the colour separation. 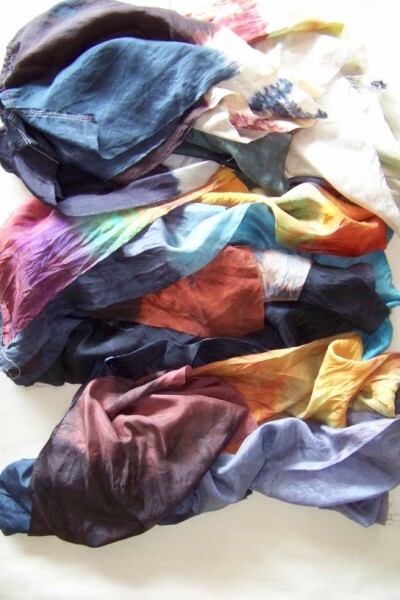 Also discharging on other fabrics/fibres will of course get different results, and what would happen if you combined dye systems with different discharge systems…. At least now I have experienced all 3 standard discharge processes and have a point of comparison. And then there was what could have been a near disaster….I got side tracked and left a dye pot simmering for 2 hours. 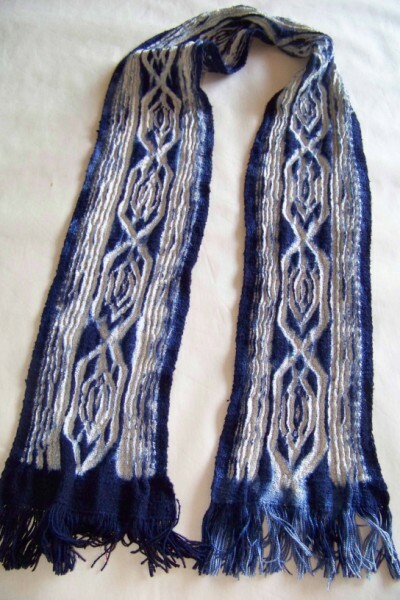 I had spent a number of days weaving weft shibori on the drawloom. One scarf was in the pot…… I approached the pot wondering what disaster awaited me. I hadn’t boiled it dry. I was lucky! AND it turned out the most beautiful deep blue. You are currently browsing the Kay Faulkner's Blog blog archives for April, 2010.